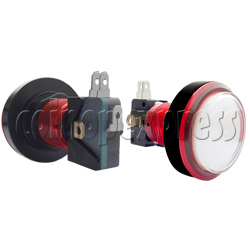 Round illuminated push button with LED light features in colored body with white top. It designs in 46mm diameter, durable ABS plastic construction, high quality made microswitch mounted into, reliable for long reliable service. This button is suitable for all kinds of amusement machine.